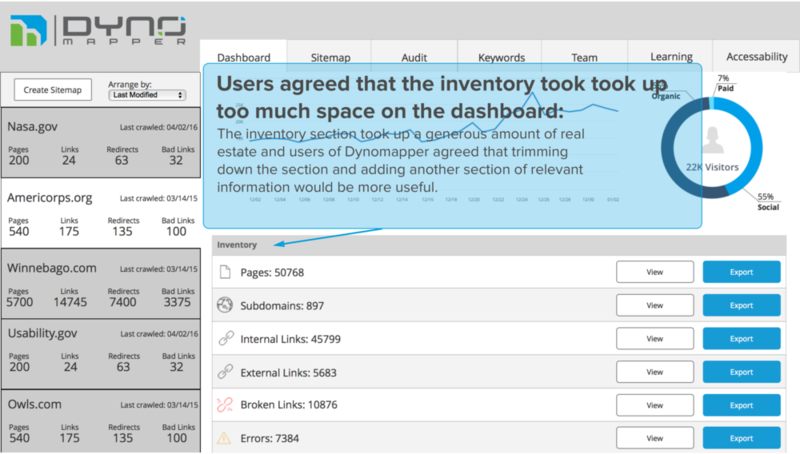 DYNOmapper is a powerful SaaS platform used for visual site mapping, SEO, and data analytics. The software is currently being used by Adobe, Razorfish, and Atlantic Airways. Our team applied ethnographic methods, conducted rigorous domain research, competitive analysis, and usability testing to design a dashboard for DYNOmapper's user interface. Our goal was to delicately balance usability with the power of DYNOmapper's robust features. After synthesizing our research based on Indi Young's Mental Models, we restructured the navigation and reorganized the software's tools and features. The results of our research produced an information dense yet easily navigable dashboard. Click here to see the final prototype. To kick off our research, we began exploring content strategy, site crawling, site mapping, and SEO. Because of the specificity of the domain, getting a perspective on the competitive landscape was key in moving forward with the research. Our client worked in content strategy and web management for over 10 years and found that site crawling software on the market was lacking the ability to manage massive amounts of data, and he created DYNOmapper to fill in the gaps on the market. Unlike other site crawling software services, DYNOmapper’s capabilities outweighed the competition in terms of its power and robust features. For example, where other site crawling softwares max out at 5,000 pages, DYNOmapper is able to crawl a site with over 50,000 pages. Further, we found that competitors couldn’t handle a large database of users. One of the most interesting aspects of this project was conducting ethnographic interviews. Because the domain was so specific, it was challenging to find target users, and we had to leverage our network to find experts in the field. By identifying a target audience, we saw an opportunity to differentiate the design against DYNOmapper’s competitors. The interviews provided a wealth of data for us to synthesize and define. We eventually transcribed the interviews and combed through them using the mental model. This will be elaborated on further in the next section. To move forward with data analysis, we cracked open Indi Young’s Mental Models. Mental modeling is a design strategy that investigates the mental spaces of users to understand their patterns and behaviors. We believed mental modeling was applicable to synthesizing our data because it represents the goal of the user in the context of their domain (Young; 12.122). We knew that thoroughly understanding the mental spaces of our users would establish the foundation of our design. The idea highlighted by Young was, rather than forcing tasks into predetermined categories, let the tasks organizes themselves into clusters of relative data. By doing this, the data highlighted common pain points and feature gaps in a highly structured layout. The visual formatting of the mental model included task groups which were represented in towers, and mental spaces represented as a series of task groups. Below the mental spaces are boxes representing features within the software. The mental modeling process allowed us to identify broad behaviors and frustrations relating to the user’s understanding of DYNOmapper. Furthermore, it allowed us to validate our assumptions and highlight usability issues. Following the mental model, we developed a journey map out of the data gathered from the ethnographic interviews. We pulled data points from the mental model to portray a journey where the user maps and redesigns a client website. We did this to underline the way in which a user engages with the software and to highlight features gaps, pain points, and opportunities. Teams Tab: we integrated all stakeholder related functions including user permissions, comments, and recent activity in one tab titled "team"
How did we restructure the architecture of DYNOmapper into a dashboard that incorporates all of it’s features while emphasizing usability? Users wanted an information dense snap shot of inventory and analytics and emphasized the importance of the inventory section. Users needed immediate access to information that would warrant a notification such as broken links and errors. Furthermore, users emphasized the problem of not being able to see where others previously edited information. My idea was to create an activity feed that listed the actions of users working on a project. Further, users pointed out the usefulness glancing at site analytics, and at the bottom of the dashboard, I created a space for analytics information. To allow users access to the many features within DYNOmapper, I decided to go with tabs in the top navigation. 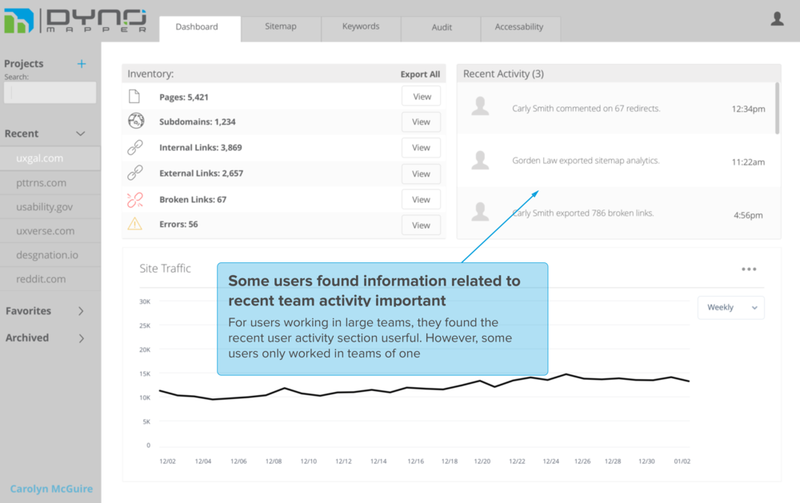 The user can easily toggle back and forth between their dashboard, site map, keywords, audit, and accessibility pages. I took ownership of the first prototype shown below. Does the software allow interactions within large teams and isunobtrusive for people working in small teams? Again we reached out to the community of content strategists, web managers and UX designers to validate our concepts as useful and viable. The following is a list of feedback we received during concept testing. We decided to create the final prototype in Axure because we wanted to gain a deeper understanding of the software and because of the flexibility of Axure to create complex interactions. After converging our ideas into one solidified prototype we conducted usability tests with current users of DYNOmapper. What did we find? Additionally, we trimmed down the size of the inventory section and added a section that included keywords, average time on site, and bounce rate. By doing this we addressed the issue of providing a granule breakdown of analytics information and decreased the visual weight of the inventory section. To resolve the design challenge, we created a cohesive way for users to access the complex information and functions of DYNOmapper through an integrated dashboard with an inventory and analytics system for all site content. Our results struck a user-validated and rigorously deliberated balance between precision and accessibility. We presented the final project and deliverables to the client and he was extremely excited to implement the design. We are in a continuing conversation with him about what we can do to help him implement and if he has questions about future UX needs. I sharpened my interviewing and presenting skills, and my teammate Ayon encouraged me to lead every interview and meeting. This is something I struggle with, but I continue to work on as much as possible. Mental modeling is a method I will continue to apply in my design process because it's a thorough way to synthesize data. I really enjoyed reading Young's book and I highly recommend it to any level of designer. Overall, I developed my knowledge of content strategy, SEO, and content auditing. It's a fascinating domain and I feel like I developed my technical skills. If you're interested in my work and would like to build something similar please shoot me an email below. I'd love to hear from you!